My recent comparison of Parallels Desktop and VMware Fusion attracted a lot of comments, many of which pointed out a third, free virtualization app for the Mac: VirtualBox. I confess that I’ve been blissfully unaware of VirtualBox, despite it being around for a couple of years. To be fair, the Mac version only came out of beta at the start of this month – at least, that’s my excuse! – and this is the version I’ll review here. VirtualBox actually comes in two flavours: an open-source GPL edition, and a proprietary “VirtualBox Personal Use and Evaluation License (PUEL)” edition. The latter is free as in beer, provided of course it’s just for personal use or evaluation purposes. It also has more features than the GPL edition at the time of writing, including USB support and an RDP server for remote access (here’s a full list of the differences). For the purposes of this review I tested the PUEL edition. 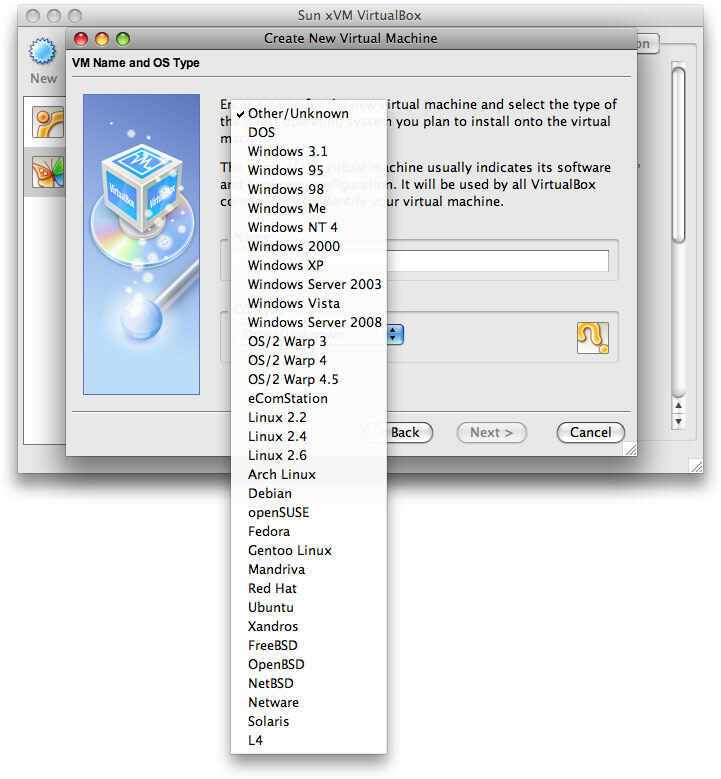 VirtualBox supports a wide range of guest operating systems, including most flavours of Windows, many Linux distros, FreeBSD, DOS and even NetWare. VirtualBox includes tools for both Windows and Linux guests. These are called Guest Additions, and work in much the same way as Parallels Tools and VMware Tools – you get smooth graphics and mouse performance, as well as the ability to resize the guest desktop simply by resizing the VM window. Creating a new VM. VirtualBox supports an impressive range of guest systems. One of the great things about Intel Macs is that you can run Windows on them. Why would you want to run Windows on a Mac? Well, there are many applications – including most games – that are only available for Windows. By running Windows on your Mac as well as Mac OS X, you get the best of both worlds – the loveliness of MAC OS X, and the compatibility of Windows. There are two applications that you can use to run Windows simultaneously with Mac OS X: Parallels Desktop and VMware Fusion. How do they compare? I’ve been using Parallels Desktop since I bought my Mac back in 2006 (in fact I bought Parallels before the Mac!). It does the job well enough, but recently the nice folks at VMware gave me a review copy of VMware Fusion. So I thought I’d give Fusion a quick spin and see how it compares. The versions I’m reviewing here are Parallels Desktop 3.0 (Build 5582) and VMware Fusion 1.1.2 (87978). I didn’t want to muck about installing a fresh copy of Windows, or deal with Windows XP reactivation grief, so I used the VMware Importer to migrate a Windows 2000 Parallels virtual machine across to VMware Fusion. The Importer was a bit ropey – it spent 15 minutes converting the drive before informing me that the VM was suspended, so it couldn’t finish the import – but to be fair, it’s still in beta. In fact Darren disagrees with this statement, arguing that many of the above 8 pillars are unlikely to ever make their way out of the Apple factory gates. I agree that some, such as Apple iPhotoFrames, sound a bit far-fetched. Also, why no mention of the iPod or iPhone? Does Forrester think these won’t be part of Apple’s digital media strategy? Posted in Cult of Mac | Comments Off on The Apple iHome? 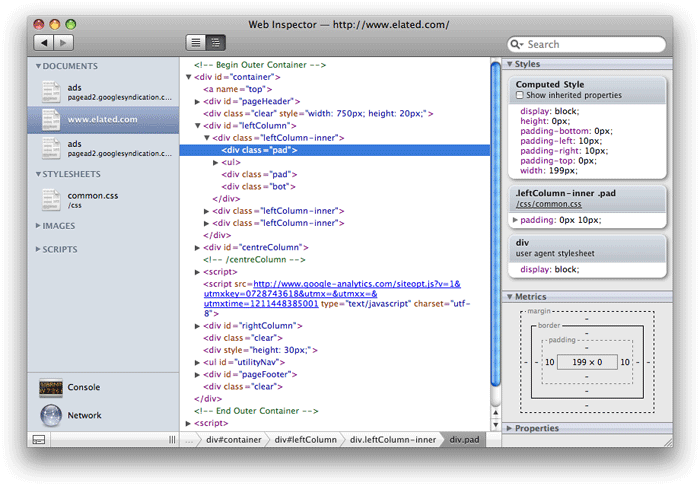 If you’re a Web coder, Safari 3 offers some really nice debugging features – if you know where to look for them. First, you need to turn on Safari’s Develop menu (hidden by default). 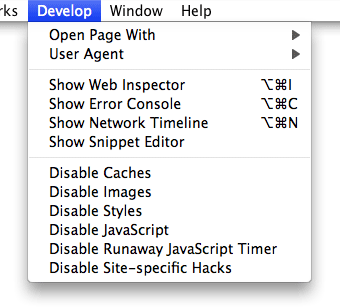 To do this, choose Safari > Preferences, then in the Advanced tab check the Show Develop menu in menu bar option. You’ll see the new menu appear to the right of the Bookmarks menu in the menu bar. The first option, Open Page With, lets you open the current page in any other installed browser – handy for cross-browser testing. 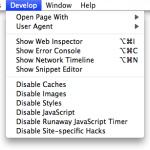 The second, User Agent, tells Safari to masquerade as another browser when viewing websites. Safari still renders pages as Safari, but sends another user agent string to the Web server. This can be useful if you’re testing browser detection code, for example. I’ve ranted at great length about the usability nightmare that is iCal – and the fact that Leopard’s iCal is, if anything, worse than Tiger’s. One saving grace of Leopard, though, is that Apple have opened up the iCal framework, allowing other apps to create and edit events and To Dos. And sure enough, such apps are starting to emerge. Here’s a quick look at a couple of free To Do applications for Leopard. One new app I’m currently playing with is FlexTD. This app’s sole objective is to make it quick and easy to enter new To Dos. It installs itself as a preference pane; all you have to do is assign a keyboard shortcut to it. Then, whenever you want to add a new To Do, you press the keyboard shortcut (from within any app) and start typing. It’s fully keyboard accessible, so you can set the calendar, priority and due date easily via the keyboard. It’s nicely done, but it’s a shame you can’t edit the Note field as you’re creating a To Do, which makes project entry a la GTD a pain. Apple’s bright Mac displays are great for showing off beautiful photos, and I love having stunning wallpapers on my iMac’s desktop. 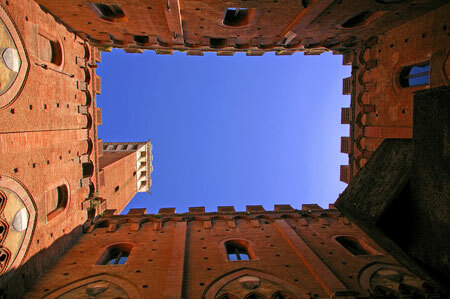 However, not all wallpapers are a good fit for the widescreen displays used on current Macs. So I thought I’d hunt around for some really good quality widescreen images. 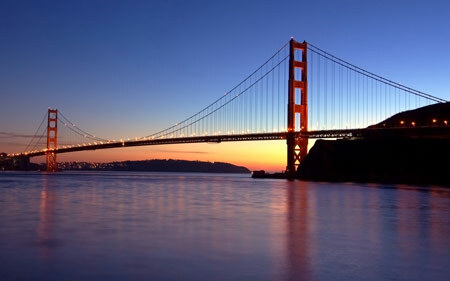 InterfaceLIFT provides a nice selection of over 1,500 high-res widescreen wallpaper images – perfect for the Mac’s screen. They also provide nice icon sets that you can use to customize your file and folder icons (info on how to do this). Well this review of Mac OS X Leopard could fill a book, so I’m going to wrap things up now. I’ll briefly talk about other new features of note, and attempt to reach some sort of conclusion about the latest Mac OS. Apple have added tons of snazzy new features to iChat AV. Major ones include Photo Booth-style effects, the ability to have a picture or movie backdrop, screen sharing, audio/video chat recording, tabbed chats, and iChat Theater – a feature that lets you show movies, Keynote presentations and other media to your chat buddy while you’re talking to them. I haven’t had a chance to use most of these new features yet, but the backdrop effect is quite fun – though the backdrop tends to leak through quite a bit. One simple but nice improvement is that the Buddy List window now allows buddy groups, making it much easier to organize your list of buddies. In my ongoing Leopard review I’m currently looking at the Apple applications that are bundled with Mac OS X – at least, the apps that I personally use on a regular basis. I was going to write about just Mail, iCal and Preview, but then I remembered there’s another app that I use that has had major changes in Leopard: Front Row. We actually use Front Row fairly extensively; we don’t have a TV (shock horror! ), so we watch DVDs and a lot of video podcasts on the living room iMac, as well as listen to music on it (streamed from the iTunes on my Mac). So is the new Front Row a step forward like Preview, or is it one step forward, two steps back, like Mail? Let’s see. On the plus side, the daft swirly effect when you launch/exit Front Row is replaced by a simple fade, which makes for a smoother transition to Front Row and back. 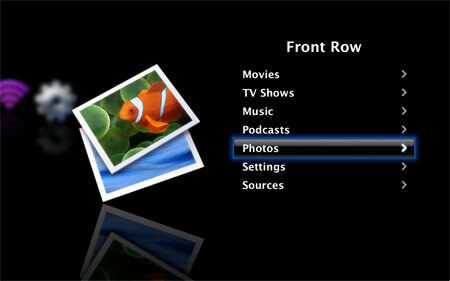 The new Front Row interface on the whole is slicker – much like the Apple TV interface, in fact. The fonts are a lot smaller than Tiger’s Front Row, so if you plan to watch movies on your MacBook from across the room, you might be squinting a bit. On the other hand, this means that you can see more of song/movie titles while you’re browsing. Even better: When browsing, the titles for both audio and video media now scroll horizontally if they’re too long to display in one go. This feature is wonderful, as I’m no longer having to play “guess the podcast” with long podcast titles, for example. Viewing theatrical trailers is generally a nicer experience in Leopard’s Front Row. You now get some blurb about each movie as you’re browsing it (replete with the occasional HTML character code – oops! ), and you can also see the download progress of a trailer as it loads – a feature sorely missing in Tiger. However, in Tiger you browsed movies by poster artwork – a nice, intuitive way to find movies. Now you just get a list of titles, and you can only view the poster for the currently selected movie. 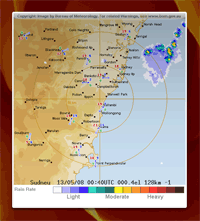 Many of the core applications in Mac OS X have been significantly upgraded in Leopard. I’ve already taken a look at Mail and iCal in my review. Here I’ll concentrate on Preview, Apple’s PDF and image viewer. As the built-in apps go, Preview is a bit of an unsung hero. It pops up when you view a PDF, then you close it when you’re done – you don’t tend to think about it much. 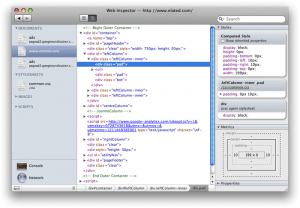 However, it’s a supremely useful and well-written application, and with the release of Leopard, it’s now even better. Preview in Leopard has vastly improved annotation features. You can highlight text, and add sticky notes, ovals, rectangles, and URL links. (I was disappointed that you can’t constrain ovals to circles and rectangles to squares, but hey, you can’t have everything I suppose.) You can add your name to annotations too (enabled by default in Preferences > General). 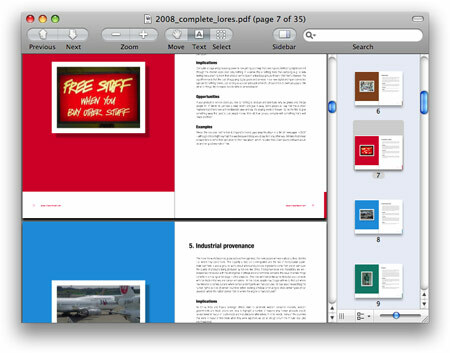 All annotations are retained when you save the PDF. My epic Leopard review continues. At this rate I’ll have to give it its own blog category. 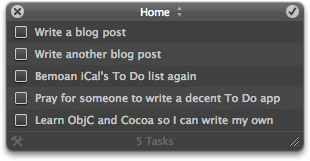 Today I’ll take a look at iCal, the calendar/task manager app that ships with Mac OS X.
I’ve bitched about Tiger iCal’s hideous user interface before – particularly its heinous lack of keyboard shortcuts for basic tasks. So does Leopard’s iCal mark an improvement over Tiger’s? Well, yes and no. 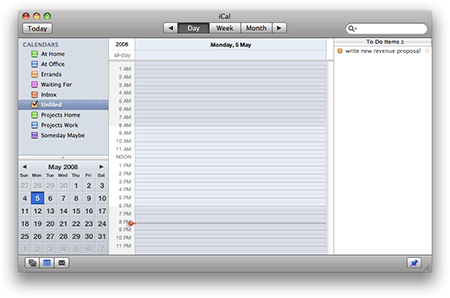 The iCal interface has had a makeover, and definitely looks and feels slicker than Tiger’s iCal. In addition, as with the new Mail, the interface feels more responsive, too. You are currently browsing the Reality Distortion: Macs, Mac OS X, and Apple stuff weblog archives for May, 2008.